So...I recently picked up a B&K 3030 power amp to drive my new Polk LSiM705's. I've always used a great old Kenwood KA-8004 to drive my other Polk speakers (RTi12's), but i wanted to get in on the power amp world. The Kenwood KA-8004 has a preout as well as the old Pioneer SA-9100 I own. Yes you can, but not sure why one would want to, unless your trying to avoid purchasing a pre because of spending money. It'll vary from amplifier to amplifier, but the preamp sections in the vintage Japanese massmarket integrated amplifiers were generally nothing special. Certainly worth a try, given that you have it already. Has the KA-8004 been rehabbed or is it original? If the latter, it will, at the least, be chockablock with tired electrolytic capacitors (which will almost certainly have sonic consequences). It’s more just because I already own them and they have the capability and they seem to be great intigrateds in their own right. I'm sure they are since you already own them you might as well try it. I wouldn't start a new system that way though. So I guess I’m looking for reasons why a decent intigrated wouldn’t make a good Pre. And what makes a “good” vs “bad” preamp? I’m new to all of this. If the sound is powerful and clean when using it as an intigrated, what would it make it not so as the Preamp to my B&K? Integrated serviceable as a pre yes, as good as a standalone pre no, hope that helps. The preamps in most integrated amplifiers of that era almost always have compromises in design and components used -- compromises driven by economics and practical considerations (space!). Some of the integrated amplfiers had notoriously mediocre preamps -- harman/kardon's A-402, and the earlier, vacuum tube Dynaco SCA-35 are well known examples. Using your "decent" integrated as a pre can only sound better. You can do a lot better with separates but stand alone preamps can get expensive and you will have to decide if it is worth it to you. Until then crank your new system up and enjoy. Sometimes it is good, sometimes not. I like the way my Denon DRA-835R sounds through its built in amp. However, I tried using the pre-outs going into my Parasound HCA-1000A and it didn't sound so good. I guess they are just a bad match. A little outside the lines of this but I had the Marantz AVR acting as a pre for my two from channels running Linn amps. When I stuck the PS Audio Stellar Gain pre in the middle of it (to isolate the 2ch source material) things basically woke up. We don’t know what we don’t know and until I did that, I thought my system sounded great. Trial and error (and a little bit of coin sometimes) all participate. I used a more modern 2-channel receiver HK 3490. Used the preout to a Parasound and loved it. Ya do the Hokey Pokey and you turn yourself around....that's what it's all about. So any recommendations for standalone Preamps? I see some people using new ones that cost $100 and some using ones over $1000 so it’s very confusing. Can a Pre vary THAT much in sound since it’s really just supposed be a non-colored signal pass through to the power amp, right? Ask yourself the same question in regards to speakers. $100 vs $1000 vs $10000 etc. Definitely some good options for you in the $500-$1000 range. And even more so used. I used an integrated for the longest time as a preamp. When I finally switched to a dedicated pre, the world came alive! If you have the room, separates are the way to go. And that way you can switch em out, upgrade, as you move along your journey. Just my experience. I mean, you can get one for $31. See that’s a case in point. Some people are driving their high end systems with $75 little preamps so back to my original question, why would something like that possibly be better then the preout on my nice old integrated? I mean hell for $75, it would be worth the experiment I suppose. Then there are $2000 preamps so it’s all confusing to me. Why would it be confusing ? Pre amps, like any other piece in your system vary in sound quality, and price. You could pay north of 15k for certain pre amps....or 75 bucks, but you certainly aren't going to get the same sound quality. Some people collect AMC Gremlins. I am pretty much guarantee that one gets what one pays for -- the folks that run these $31 Asian wonders have probably not compared them to anything that wasn't mediocre. Preamps are important. I don't use an active preamp, because I've yet to find one that I really like -- that doesn't take me a notch away from the performance. Some of that is financial (i.e., I am not keen to spend big $ on an active preamp); some of it opportunistic (what I own and what I've had a chance to audition with my own equipment). I am NOT SAYING that there aren't good preamps, vintage or new; storebought or DIY -- I AM SAYING that they aren't necessary easy to find, especially on a (tight) budget). Here's the thing: The preamp in your old Kenwood is probably perfectly OK. Dollar for dollar, then or now, it wouldn't match a dedicated preamp -- because those dollars were invested in the power amp, too! In other words, if the MSRP on that KA8004 (probably ca. 1974? I'm guessing here) was $350, probably $100 to150 of that value was in the preamp section. 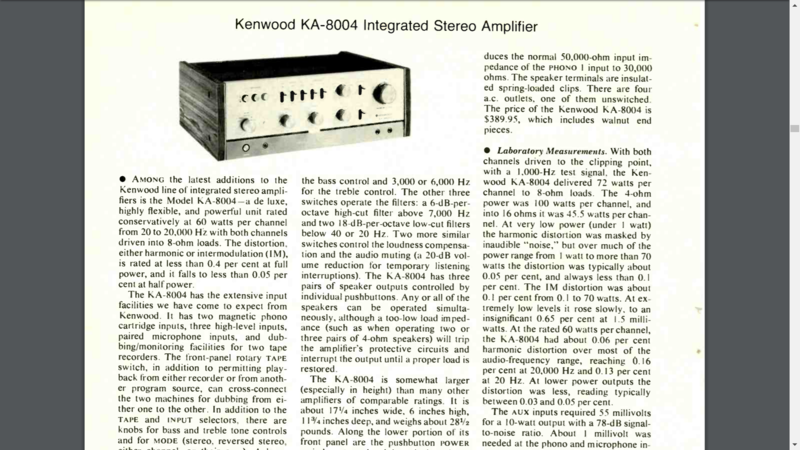 Even in 1974, $150 bought one an entry-level preamp. tired. Especially the electrolytic capacitors. The amp will not sound as new nor as good as it can with forty-plus year old electrolytics in it. Until or unless that's been addressed, the preamp may sound perfectly OK, but it will not be performing at its own potential. Add that to the fact that its own potential was probably middling when new, and you're not likely to be getting great sound out of the KA8004. ALL THAT SAID, it costs you nothing to try, and it is more than worthy of trial. If you like what you hear, you're all set. Stereo Review's redoubtable Julian Hirsch tested it in November, 1973. You can read the review in this PDF from www.americanradiohistory.com (an amazing site, if you're not familiar with it!). You will need decent cables to connect the pre to the amp. Oh boy. This audiophile hobby is expensive! Recommendations on cables? Thanks everyone already. Shunyata cables are available at various price points. From entry to TOTL they are worth it. The Cable Company has good prices. How cool was that??!! Thanks for posting. Amazing to read an original review my amp from when I was four years old. 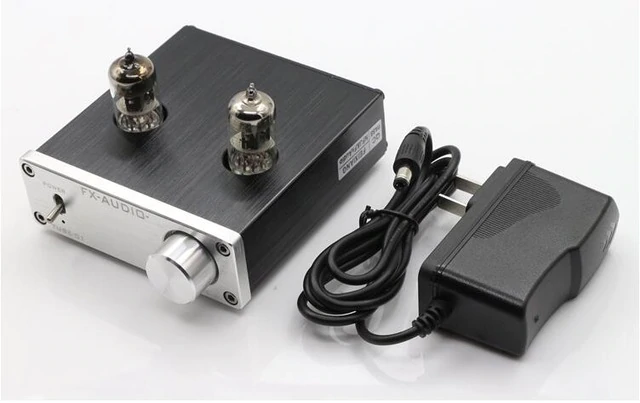 Not to thread-jack, but I am using the pre-outs from my Kenwood KA-8150 y'd out to my GFA555->SRS2’s and feeding the power amp section of the 8150 so I can use it to drive my KG4’s or RTA12c's (mood dependent I turn off 555/SDA's and turn on either A or B outputs on 8150). I have been very pleased with this configuration vs using my Marantz AVR pre-outs with L/R bypass enabled for 2ch listening. How detrimental to the signal is y'ing the output like that? If you like what your hearing....does it matter ? Using a "Y" cable to mix signals is not (as we also say in my line of work) a best practice. Here's the Scripture (IMO) on "Y-ing"
It's a little abstruse, since it is primarily directed at the "pro" industry, using balanced interconnects -- but it's good info. Rane has a whole library of similar white papers on such deceptively-simple-but-not-really considerations as grounding. $350 for the least expensive pair. That's more then my B&K 3030 power amp cost me. I'm all in on this audiophile game, but boutique expensive RCA cables? Can they possibly make that much of an audible difference that warrant the prices I'm seeing? I'm kinda stunned. Maybe I'll start with some Blue Jeans which seem to be a reasonable choice over the $3.00 Monoprice ones I've always used. Blue Jeans or Signal Cable always a great starting point at which you should hear a difference vs. Monoprice.